When a picture is worth a thousand words our Build your Own custom buckles tell your story your way. Choose from a selection of options; engraving, stones, figures, lettering, date trim, and paint color to personalize your custom buckle, award or gift. Best Bang for your Buckle! ✓ Quick and easy ordering! Design Your Own Buckle, award or gift and create a treasured piece. Design your own from scratch with your inspiration and our expertise. We WILL create your Designer Buckle or Award. ✓ Designed from scratch according to your vision! The Design Your Own order process begins with an easy online Design Your Own form. Following the entry of your form you will be assigned a personal Design Your Own Specialist who will contact you in 5-7 business days with the first sketch of your design. Click below to begin the journey of Designing Your Own by filling out our easy form and view our Custom Buckles & Awards flipbook for inspiration. Choose from a variety of different belt buckle templates and customizable options when you build your own Western belt buckle with Montana Silversmiths. Use personalized engraving, gemstones, figures and images, lettering, date trim and paint color to tell your story in any way you choose. These custom buckles make excellent gifts and can be used as rodeo competition awards or trophies. Ordering personalized belt buckles is quick and easy. The listed prices are all inclusive. Your finished product will be delivered in just 4 to 6 weeks. 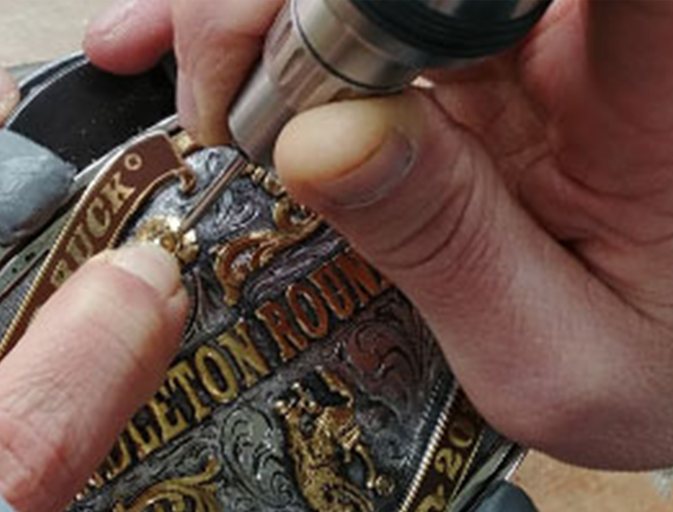 Each custom buckle is made to order in Columbus, Montana. We offer a large selection of build your own buckles and gifts. Hundreds of different figure options are available. Use the custom engraving to add names and messages to the buckle. In addition to engraving, options include paint color, gemstones, lettering, dates and more. Brands and logos can be custom cut and added to the buckle. To order your personalized buckle, call our customer service department at (855) 358-5002 or email us at websales@montanasilversmiths.com. 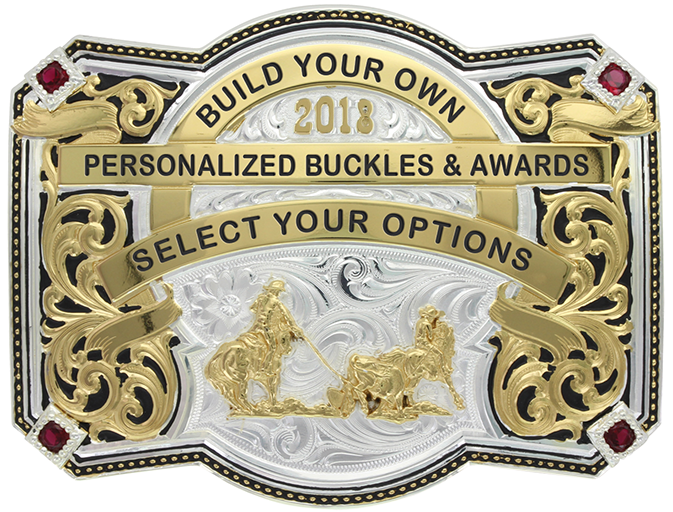 You can also fill out the build your own buckle form to easily view each option and submit your order. Access the form by clicking the button below. If you have a very specific idea for a Western belt buckle, let Montana Silversmiths help you bring that idea to life by designing your own buckle. This option allows you to work with an expert to design your own buckle from scratch. We will combine your inspiration with our expertise to create your personalized belt buckle. This option is perfect for gifts or rodeo competition awards. We offer competitive and association pricing for custom buckles. Each piece is crafted from completely custom artwork. The finished product will be delivered in about 8 weeks. Choose from many different customizable options when you place your order. Bring your vision to life by designing a buckle from scratch. Precious metals and gemstones are available as value-added options. To begin the ordering process, fill out the easy Design Your Own form. Be as specific as possible with your request. After the form is filled out a Design Your Own Specialist will be assigned to your project. This specialist will contact you within 5 to 7 business days with the first sketch of your design. From there, you will decide if you’d like to finalize the order and you’ll work with the designer to make any necessary changes.